Today legal publisher Fastcase announced the addition of a library of world-class employment law practice materials to its portfolio. In conjunction with Littler Mendelson, the largest global employment and labor law firm, Fastcase is now offering 79 titles from the Littler Employer Library within the Fastcase legal research platform. This latest addition of secondary materials is now available for purchase within the Fastcase platform. Fastcase subscribers will also see relevant Littler publications in their search and suggested results. The collection includes the full Littler Library with both national and state titles. National titles include: Littler on Bankruptcy and Employment Law Issues, Littler on Disability in the Workplace, Littler on Classifying Workers: Employees v. Independent Contractors, Joint Employees, & Other Contingent Workforce Issues, and many more. "The chance to add the Littler Employment titles to Fastcase provides our subscribers with fantastic federal and state content relevant to all of the states where our subscribers practice. We could not be more excited about adding this authored expertise," said Steve Errick, Fastcase Chief Operating Officer. "We are eager to share titles from the Littler library with Fastcase and provide a new publishing avenue for our legal authors," said Scott Rechtschaffen, Littler's Chief Knowledge Officer. "Sharing our resources through this publishing relationship introduces the collective experience of Littler's attorneys to the legal community and provides legal practitioners with another resource for employment law information." Fastcase continues to add must-have content for its subscribers and provide leading legal analysis with contributions from firm partners across the country. With the addition of Littler's library of employment law publications, the Wolters Kluwer Treatise Library, expert blogs from LexBlog, and the recently debuted imprint, Full Court Press featuring Artificial Intelligence &amp; Law" onclick="linkClick(this.href)" rel="nofollow">RAIL: The Journal of Robotics, Artificial Intelligence & Law, the expert author publications available within Fastcase are quickly emerging as an invaluable resource for attorneys. The 2018 roadmap for Fastcase includes a rapid expansion of secondary libraries, featuring franchise authors who embrace Fastcase as a steward and distributor of their works. 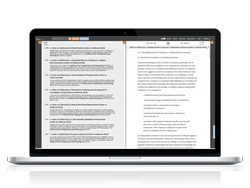 "People know Fastcase as a great legal research engine for primary law," said Fastcase CEO Ed Walters, "and increasingly it's a home for expert treatises and commentary as well. With Full Court Press, LexBlog, and legal industry experts like Littler, Fastcase is rapidly becoming a leader in secondary materials." As the smarter alternative for legal research, Fastcase democratizes the law, making it more accessible to more people. Using patented software that combines the best of legal research with the best of Web search, Fastcase helps busy users sift through the clutter, ranking the best cases first and enabling the re-sorting of results to find answers fast. Founded in 1999, Fastcase has more than 800,000 subscribers from around the world. Fastcase is an American company based in Washington, D.C. For more information, follow Fastcase on Twitter at @Fastcase or visit http://www.fastcase.com.